You can understand the despair in the House of Bishops. Not only did the Conservative Party win an outright majority in the 2015 General Election, but Labour is in meltdown, even possibly on the verge of schism as Jeremy Corbyn threatens to wipe New Labour off the face of the earth and reestablish the Clause IV vision: “To secure for the workers by hand or by brain the full fruits of their industry and the most equitable distribution thereof that may be possible upon the basis of the common ownership of the means of production, distribution and exchange, and the best obtainable system of popular administration and control of each industry or service.” It is the authentic Christian Socialist vocation. The problem is that the Labour Party (as currently constituted) no longer believes it: when Tony Blair ditched Clause IV, he alienated millions of traditional socialists who felt their heart had been ripped out and their soul prostituted in the pursuit of power. The fact that Blair went on to win three general elections is neither here nor there: the philosophical purists would rather keep their integrity out of office than bastardise it for the fringe benefits of government under the hegemony of coiffed and polished politicians who prize PR above righteous democratic socialism. And so we saw the revival of the evangelical Socialist Party, with its authentic, un-spun spontaneity and communist conviction. Jeremy Corbyn exudes realness in shedloads. You may abhor his Trotskyite solidarity and anti-Capitalist militancy, but, in an age of glossy political policy and TV-sofa government, he is earthed, orthodox and kosher: he says what he means and means what he says. If you want brass tacks and card-carrying conviction, Corbyn is your anti-Establishment, anti-Westminster-bubble, anti-political-consensus original man. By contrast, Andy Burnham, Liz Kendall and Yvette Cooper seem fabricated for phony airs and shallow graces. Labour Party members (if not the members of all political parties) are rather tired of being patronised or snubbed by coiffed and cultivated elites who only stoop to listen at election time. And even then there’s more hearing than listening. 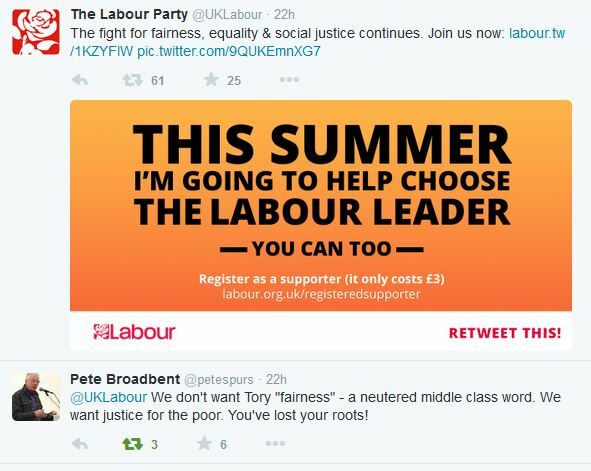 Within the Labour movement, there’s a yearning for and true solidarity with the poor. It is in that context that we must understand the Twitter plea of the Rt Rev’d Pete Broadbent, “Bishop of Willesden & Acting Bishop of Edmonton. Spurs season ticket holder. Socialist. Republican. Banter and epigram fan. Chair of Spring Harvest & ICC”. It is not ‘fairness’ that the Socialist Bishop of Willesden demands, but real justice for the poor and comfort for the oppressed, vulnerable and alienated. He fully expects the evil Tories to ride roughshod over widows and orphans, but the collusion of the Party of God in George Osborne’s abuse and Iain Duncan Smith’s injustice is objectionable to real Christians and offensive to Christ. “You’ve lost your roots!” he cries, deploring the preeminence of the middle-class vernacular over the lingo of the common man. Labour Party HQ, he avers, is preaching foolishness to the Greeks. I can’t say that I was unhappy there — I had a clean bed to sleep in (in it at 8 o’clock and up at 6 to the sound of a bugle played by one of the band boys). We had our own military band. I tried to get into the band to play the clarinet. I was learning to run up and down the scale by music score for about two months.. Every six months, a dentist would call to examine our teeth.. Once a year, in the summer, we had Sports Day.. Some of the boys then put on a show with Indian clubs and dumbbell drill, and the evening finished with dancing to the boys’ Military Band.. This project had as its treasurer John Bellers who later developed plans for a ‘College of Industry’ — a co-operative, self-sufficient, humanitarian community where up to two hundred labourers and a hundred of the impotent poor lived and worked together. There would be an emphasis on education and training, although this would be done more by object-lessons than by theory, and more by practice and experience than by rote learning. THE Churchwardens and Overseers of the Poor in this Parish, being desirous their Poor should have the same Benefit as other Parishes, of a House, where they might be provided with all Necessaries for Life, the Vestry appointed a Committee of Gentlemen, including the Churchwardens and Overseers, to take a proper House for such a Service. Accordingly in 1730, they hired a House, formerly a Tavern in Fish-street in the Parish of St. Nicholas Cole-Abby and at Christmas the same Year, opened it for all their poor Pensioners, where they are very cleanly dieted and lodged, under the Care of a Mistress. A co-operative, self-sufficient, humanitarian community? Emphasis on education and training? Benefits for the poor? The provision of “all Necessaries for Life? 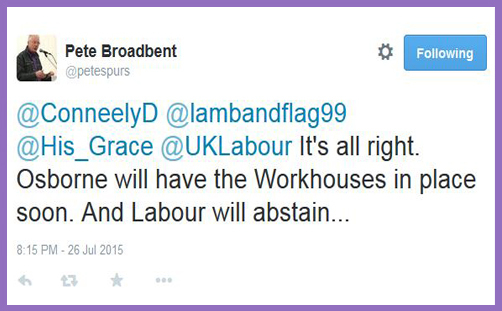 Don’t George Osborne’s workhouses sound rather more like Jeremy Corbyn’s authentic vision of the New Jerusalem?